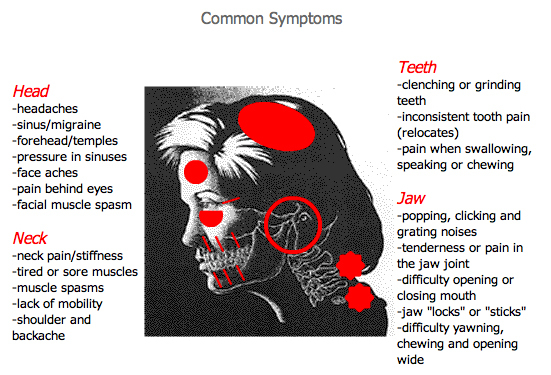 The temporomandibular joint, or TMJ, is the jaw joint, located on either side of the face, just in front of the ear. TMJ Disorder is a condition that occurs when the TMJs are subjected to excess pressure through misalignment of the teeth or malfunction of the muscles/ jaw. According to the American Dental Association, approximately 75 million people in the United States suffer from some form of TMJ Disorder. Incorrect swallowing habit from childhood which pushes the jaw back. Incorrect jaw growth causing mismatch of the upper and lower jaws. Trauma such as a fall or car accident (very common in whiplash injuries). Occlusion (or “bite”) that causes the jaw to be incorrectly positioned when the teeth are closed together. Diagnosis requires a complete medical history, through examination of the TMJ, teeth and muscles, X-Rays, study models and bite/TMJ analysis along with a T-scan. Treatment varies depending on your individual condition with the focus on being able to restore normal function and eliminate discomfort. These treatments may include splint therapy, physical therapy and orthodontic treatment. Surgical treatment is very rare and can be avoided with early treatment.